Milliken’s Cable Management business launched its newest product for the telecommunications industry. Vis Divide, segmented high-density polyethylene (HDPE) rigid conduit that provides dedicated pathways for placing more than one cable in a single conduit, now offers three available pathways. The fa..
Advanced Drainage Systems, Inc.’s SiteASSIST mobile application provides detailed instructions and animated videos for the installation of StormTech chambers, which are widely used in underground stormwater retention and detention systems. Another beneficial feature is the app’s ability to provide t..
For most wastewater and sanitary system cleaning jobs, it takes several minutes for sewer cleaner operators to lift additional debris tubes off the racks, maneuver the truck’s boom and clamp the tubes into place – a process that can lead to operator fatigue. To improve this time-consuming process, V..
American Augers/Trencor, a Charles Machine Works company, released the first large-scale upgrade to its proven 1400-series trencher line. The new T14-54/617 offers an emissions-compliant engine, state-of-the-art electronics and customer-requested features. “The T14 pays tribute to the venerable 140..
Doosan Infracore North America LLC, has extended its wheel loader lineup with the new DL280-5, part of the popular category of 3- to 4-cubic-yard units. The new wheel loader is designed to provide operators with enhanced performance and comfort, as well as increased uptime protection when working in.. The new Vermeer MUD Hub slurry solidification system helps control the costs, time and complexity of drilling fluid management. Using the Vermeer ST2000 slat tank and the Surface to Surface (STS) FL-243 solidification mixer, MUD Hub helps create stackable material for convenient transfer and disposa..
HammerHead Trenchless, a Charles Machine Works company, has introduced a new, purpose-built trailer for cured-in-place-pipe (CIPP) applications that gives installers a uniquely versatile and efficient workstation suited to almost any job they encounter. The 20-foot-long trailer’s modular design not..
Verocomm Network has introduced a new mobile app that provides information and training content to employees in the field. The cloud-based Verocomm app is a secure, easy-to-use platform for delivering critical communications, training and safety on mobile devices, said Lawrence Martel, CEO of Aclip..
Vermeer has introduced a new multi-purpose, 127-horsepower, diesel ride-on tractor with advanced control features and improved ease of changing attachments. “The new RTX1250i2 ride-on tractor brings a new productivity to utility installation equipment,” said Ed Savage, Vermeer product manager. “It ..
Kubota Tractor Corporation has completed the purchase of nearly 318 acres of land in Ponder, Texas (Denton County), approximately 30 miles northwest of its North American headquarters in Grapevine, Texas. The newly acquired property, Kubota Ranch, will strengthen the company’s roots in the greater D.. Marking 45 years of guided boring, microtunneling, pipe jacking and tunneling equipment and solutions for installing a variety of underground infrastructure, Akkerman is hosting Akktoberfest, Sept. 18-20, at its Brownsdale, Minn, headquarters. In the tradition of Oktoberfest, the largest folk festi..
Thirty years after starting assembly of its wheel loaders in a Newnan, Ga., factory, Hitachi unveiled its latest facility expansion – a new office building next door to that plant, into which corporate headquarters will be relocated from Kennesaw, Ga. The event to commemorate the new facility took ..
A ceremony at PipeLine Machinery International’s (PLM) Victoria, Texas, Caterpillar Hydraulic Excavator Facility commemorated assembly of its 10,000th machine and delivery of the new 336F to Michels Corporation, the Brownsville, Wis., infrastructure and utility contractor. Based in Cypress, Texas (..
After a careful and thorough review of multiple responses to a request for proposals regarding cured-in-place pipe (CIPP), NASSCO accepted the proposal from the Trenchless Technology Center at Louisiana Tech University. The project will include a comprehensive evaluation of air emissions from steam ..
CUIRE is a research, education and outreach organization and part of the University of Texas at Arlington’s (UTA) Department of Civil Engineering. Since its inception in 2002, CUIRE has focused on assembling exceptional and broad-reaching engineering and technical talent to address the needs of unde..
To reduce emergency projects and impacts to the traveling public, departments of transportation (DOTs) can use spray-applied pipe linings (SAPLs) to renew deteriorated gravity stormwater conveyance conduits and culverts, provided they are discovered prior to loss of soil-structure interaction. An SA..
Oil producers laid hundreds of miles of gathering pipelines to keep pace with the shale boom across North America from 2009 to 2017. As a result, produced water production has increased exponentially with oil and gas production. Produced water is a byproduct along with the oil and gas. Oil and gas r.. 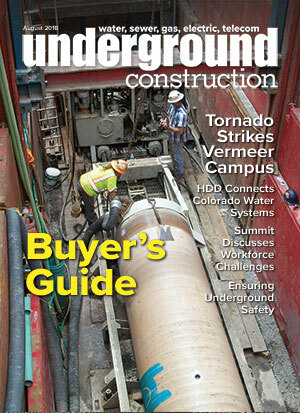 The Underground Construction Buyer’s Guide is a comprehensive list of equipment and services for the utility pipeline industry. It is published annually in print in the August issue and is available year-round at buyersguide.undergroundconstructionmagazine.com ..
by Robert Carpenter | Editor-in-Chief A special Distribution Contractors Association (DCA) Workforce Summit was held in May to unveil details about research into the many issues impacting the current and potential workforce for the gas distribution industry. DCA has taken a multi-layered approach .. In Colorado, the cities of Denver, Aurora and 10 South Metro water providers have formed a partnership that provides communities the opportunity to purchase, transport and treat available renewable water. Water Infrastructure and Supply Efficiency (WISE) is one of the first organizations of its kin.. Working the right way means working the safe way. That combination leads to keeping your team, budget and timeline protected. This is especially true in underground municipal and commercial infrastructure projects that involve building structures or installing pipe in trenches and excavation – parti..
Congressional passage of a water infrastructure bill heavily focused on Army Corps of Engineers’ projects appears imminent, after the House passed its version, Water Resources Development Act of 2018 (H.R. 8), almost unanimously – 408-2. The Senate version also passed the Environment and Public Work..
As vacuum excavators expand use beyond horizontal directional drilling (HDD) job sites to other industrial applications such as microtrenching, operators require new technology, tools and information. Ditch Witch, a Charles Machine Works Company, introduced the Certified Vacuum Excavation Training p.. Following a U.S. Environmental Protection Agency Consent Decree to improve Windward Oahu’s sewage collection and treatment system by June 2018, Brown and Caldwell worked with the city and county of Honolulu and its construction partners to deliver the Kaneohe-Kailua Wastewater Conveyance and Treatme.. The Plastics Pipe Institute Inc. (PPI), the major North American trade association representing all segments of the plastic pipe industry, has created the Polypropylene Pressure Pipe Steering Committee within its Building and Construction Division (BCD). This new group focuses on two types of polyp.. The Underground Construction Technology Association Gulf Coast Chapter held its annual Sporting Clays Event on June 8 at the Westside Sporting Grounds in Katy, Texas (Houston area). Proceeds are earmarked for the organization’s Scholarship Fund. With 124 participants and multiple sponsors, the even..
Vermeer Corporation, a major manufacturer in the underground utility and pipelines markets, was struck by an EF3 tornado about 4 p.m. on July 19 at its headquarters just outside of Pella, Iowa. Company officials reported only minor injuries, with seven people treated at the Pella Regional Health Ce..
Robert Carpenter | Editor-in-Chief In the underground infrastructure construction and rehabilitation markets, being prepared is something that is espoused by smart companies and organizations every day. It’s rare that any possible safety risk scenario on the construction site is not played out, ex..